A quadrennial event that decides the best soccer team in the world is set to come to an end soon. The buzz about the world cup and the strongest team is much louder on the web than it was years ago. Internet is swarming with soccer related posts, soccer lovers are downloading FIFA apps on their smart phones and big brands are using the event to their benefit with clever ads. In short, football is the latest craze. Everyone has one such member in the family, who does not just love football but practically lives football. These people have their favorite teams, favorite players (with their name, number, position and stats) and they follow them religiously. No matter, who your soccer fanatic is: son, daughter or spouse, help them show their team spirit by doing something different. Designers have come up with football related products in every niche to woo in the soccer lovers, so we thought to give you inspiration using season specific items for your home décor. You can do a number of things with walls like paint them with the colors of your soccer lover’s favorite team. Consider adding a huge soccer related wall sticker on the main wall. If you are unable to get one of your choice, paint a football mural on one wall. Moreover, you can utilize soccer memorabilia in decorating your room like consider hanging a team jersey, adding game tickets on the walls or players pictures around it. Options by interior decorators in Pakistan are countless. 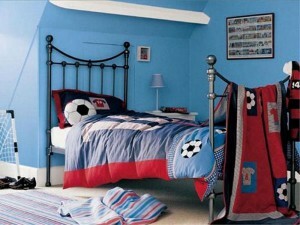 Bed is definitely the centerpiece in a bedroom and it’s pretty easy to find soccer themed bed in all sizes. Find bed that suits your soccer fanatic taste, as it will make it easy to decorate your entire bedroom in a particular theme. Spruce up the bed by adding football bedspread and pillows. You can also add goal posts, if the bedroom is spacious enough. Finding football accessories in this season is not at all difficult. You can find a number of accessories including soccer rugs for the floor, football trophy shaped lamps, players posters and small center table decoration items. You can also find washroom accessories as well. Football is a popular sport in Pakistan. 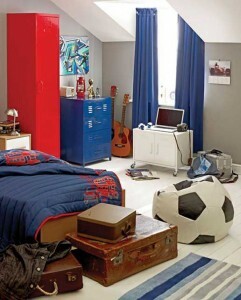 Help your family fan show his/her team spirit by giving their bedroom a facelift. However, you might not be as good in decorating a home as famous interior designers in Pakistan so, I would suggest you hiring services of Amer Adnan for perfect decor results as he is an experienced interior designer in Lahore.